Disclosure is a frequently used but rarely interrogated concept in health and social welfare. Abuse, disability, sexuality and health status can be ‘disclosed’ to peers and professionals, and on some occasions, disclosure is a requirement and not a choice. 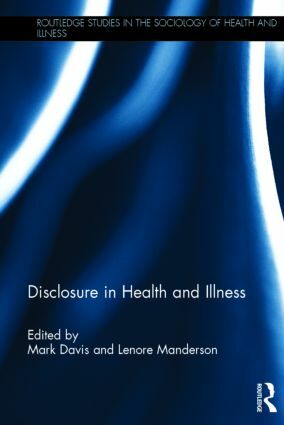 This innovative collection examines the new social and political implications of disclosure practices in health and illness. We make our identities and our connections with others by sharing life stories, experiences and innermost desires and are often asked to disclose facts about our lives, bodies and minds, at times with unintended consequences. Yet how and what, why and when people ‘disclose’ – and perceive, question and expose – and in what ways, has rarely received critical analytic attention. The contributors take up these problems by foregrounding the many shades of disclosure: from the secret, through the telling of diagnosis, to the more prosaic sharing of narratives from everyday life. The processes and implications of disclosing are addressed in areas such as: illness trajectories and end-of-life decisions; ethical research practices; medical procedures; and interpersonal relationships. Exploring the idea of disclosure as a moral imperative and a social act, this book offers a diverse range of empirical case studies, social theories and methodological insights to show how dominant and normative understandings of social relationships and their obligations shape our understanding of acts of disclosure, enquiry and exposure. It will be of interest to students and academics with an interest in narrative studies, medical anthropology, bioethics, health psychology, health studies and the sociology of health and illness. Mark Davis is Senior Lecturer in the School of Political and Social Inquiry at Monash University, Australia. Lenore Manderson is Professor in the School of Public Health, University of the Witwatersrand, South Africa. She was formerly Professor of Medical Anthropology at Monash University, Australia, and is editor of the international journal, Medical Anthropology.